The Borough of Stanhope evolved from a small, late 18th century forge town to a sizeable iron manufacturing community of the 19th century. 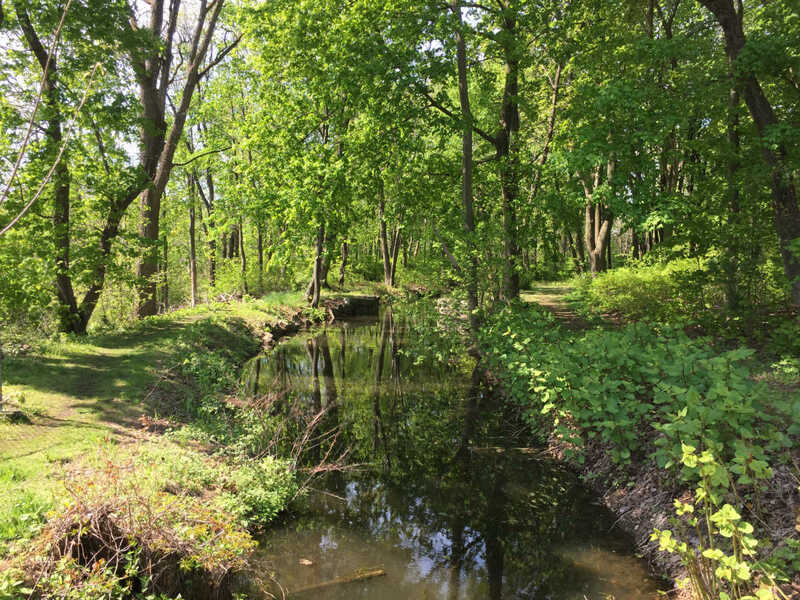 The Morris Canal, which flowed through the heart of the town, transformed Stanhope into a major outlet for canal goods into upper Sussex County. By the beginning of the 20th century, the iron complex had been enlarged many times and was under the control of the Singer Manufacturing Company of Elizabeth, N.J. Although the iron manufacturing period at Stanhope was over by about 1925, numerous remnants of the early industrial community have survived the transition to suburbia. Stanhope was initially an unincorporated village, situated in the southern part of a formerly larger Byram Township. Byram, established as a municipal entity in 1798, was created out of old Newton Township. Remaining as part of the township throughout the 19th century, Stanhope finally incorporated as a separate borough in 1904. For about 140 years, Stanhope was greatly involved in the production of iron. The Musconetcong River, which runs along the edge of the town, and the surrounding topography made the location quite a favorable one for iron manufacture. In addition to the important source of waterpower, several other vital ingredients were close at hand. Great quantities of iron ore were available at the nearby Stanhope or Hude Mine near Pennyton Homes, at the Roseville Mines in Byram Township, and also in Morris County at the Dickerson Mine in Mine Hill. Wood supply, which was essential for producing charcoal to fire the early forges and furnaces, was also conveniently nearby. The early iron companies at Stanhope owned large tracts of forested land that included all of present-day Stanhope, Netcong, Port Morris, parts of Byram Township and at least a dozen various iron mines in surrounding Morris, Sussex and Warren Counties. One final ingredient, limestone, was also within close proximity. Andover and its surrounding areas had considerable limestone deposits that yielded the all important flux required for separating the iron from the impurities in the ore. For all of the above reasons it was not surprising that early iron concerns were attracted to Stanhope. Over the years, the iron complex in Stanhope evolved to include a series of various other industries and businesses that were necessary to accommodate the growing community. These buildings were owned by the iron company but were usually operated by tenants. Included were a tannery, two grist mills, sawmills, a plaster mill and a blacksmith shop. Several stores were operated in town, the majority being depots that served the Morris Canal. Many of the above structures remain extant or are archaeological sites. Another all important ingredient to an iron company town was tenant housing, homes for the furnace laborers. Stanhope has dozens of these dwellings, which remain to illustrate the evolution of housing from the early double family tenant housing of about 1820 to the multiple family dwellings of about the 1880’s. By the 1930’s, people discovered Stanhope for what it remains today: a beautiful, rural community in the New Jersey Highlands, bordered by the Muscontecong River and Lake. Between 1930 and 1980, Stanhope’s population tripled in size and today the quaint community boasts more than 3,500 proud residents. In recent times, citizens have become more and more aware of the importance of protecting Stanhope’s natural resources. Efforts to balance development with the preservation of open space, clean water and air have been a commendable priority for its municipal leaders.